Vegetable Samosa is another famous snack from India you can find this Samosa varieties in all over the India but the method and taste may vary based on the different areas like South India and North India. even it is famous in Pakistan, Srilanka and Arab countries also. 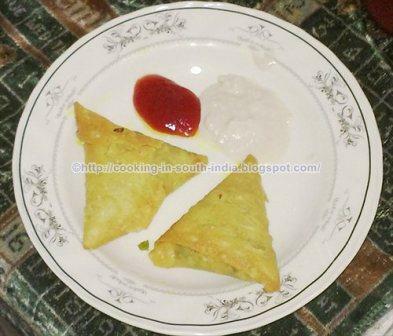 let us see how to prepare Vegetable samosa in South Indian style. Boil the Carrot, Potato, and Green peas. Mix boiled Carrot and Potato with green peas. In a pan add some oil and add onion and fry it until the onion become transparent then add Salt, Garam masala and Chili powder fry until the raw smell goes finally add Coriander leaves now the stuff is ready make small balls and keep aside. Mix it like thick dough and roll them flat with a rolling pin cut into a square pieces. Note: Here I used few vegetables, you can use whatever vegetable you like.